St Cyprian’s Church, Glentworth Street, London NW1, Saturday 13 May 2000. After completing his Tenth Symphony Dmitri Dmitriyevich Shostakovich (1906-1975) became frustrated by a relative inability to compose. This compositional drought was due, in part, to a very heavy concert schedule (Shostakovich was also a pianist of some distinction); however, he still managed to produce the Concertino for Two Pianos, the song cycle Five Romances on Texts by Dolmatovsky, three film scores, and tonight’s overture. The overture, as a musical form, features very little in Shostakovich’s oeuvre, and the Festive Overture was brought into existence through a rather strange turn of events. Shostakovich received the commission for this work literally days before the intended concert – a gathering at the Bolshoy Theatre on 6 November 1954, celebrating the 37th anniversary of the 1917 October Revolution. Vasili Nebol’sin, a conductor at the Bolshoy Theatre, found himself in the potentially disastrous position of having no suitable work with which to open this very important concert. He therefore approached Shostakovich (who was, at the time, a musical consultant at the theatre) hoping the composer might be in a position to help. When Shostakovich agreed to write the opening piece, a much relieved Nebol’sin organised couriers to take the individual sheets of manuscript (still wet with ink) to the theatre where specially employed copyists would prepare the orchestral parts. Lev Nikolayevich Lebedinsky, a musicologist and friend of Shostakovich, was at the composer’s apartment when this exceptional commission arrived: Dmitri Dmitrievich, with his strange, unpredictable, almost schizophrenic character, had the notion that I brought him good fortune, although to my knowledge I never brought him any particular luck. He said, `Lev Nikolayevich, sit down here beside me and I’ll write the overture in no time at all.’ Then he started composing. The speed with which he wrote was truly astounding. Within just two days the completed overture was in rehearsal. The overture opens with a brass fanfare, instigated by two trumpets, acting as a curtain call. The ensuing two bars for bass instruments in many respects prefigures the melodic shape of the first presto theme. The fanfare continues, adding rippling strings and wind, and a heavy organ-like bass, building towards a cadential sequence of unison chords that introduces the first presto theme. The accompaniment to this first theme has a flavour of America and, in particular, Bernstein about it, while the theme itself bears a not insignificant resemblance to the principal theme of Mikhail Glinka’s overture to his opera Ruslan and Lyudmila – Glinka being the composer regarded by Russians and Soviets as the `father of Russian music’. This theme is transported to the relative minor (F# minor) by the upper wind instruments before returning to A major with the violins. A subtle passage for trumpets (employing rapid tonguing) reminds us briefly of the opening fanfare before progressing into a section of exploration and development, emerging triumphant with the restatement of the theme, in rhythmic augmentation, by all bass instruments. The second theme emerges, in the conventional key of the dominant (E major), as a lyrical melody for horns and celli, which is appropriated by upper strings and developed thereupon. The violins gradually gravitate towards a single B-natural, whereupon a section for pizzicato strings and side drum ensues, serving as a transition back to material from the first theme. The first presto theme itself is emphatically restated and the music then builds to the first of two major climaxes in the work – the combination of both presto themes in counterpoint, employing the entire orchestra. The second theme is then given full attention before recalling some of the first theme material, which builds to the final and most profound climax of the work, the recapitulation of the opening brass fanfare. This, the most grandiose and expansive section of the work finally explodes into the coda – a dash for the finishing-line – ending an overture that, in the words of Lebedinsky, is a brilliant effervescent work, with its vivacious energy spilling over like uncorked champagne’. III – Rondo. Tempo di Menuetto. Wolfgang Amadeus Mozart (1756-1791) wrote tonight’s concerto in Mannheim in January or February of 1778, at the age of 22. He had become, even by this early age, a composer and performer of immense reputation throughout Europe – beginning his public musical career as a child prodigy, touring the various European courts together with his elder sister Maria Anna, rigorously managed by their father Leopold. The Concerto for Flute and Orchestra in G was commissioned by the Dutch amateur flautist Ferdinand Dejean, who offered the sum of 200 florins for a number of works. Besides tonight’s concerto, the results of this commission were the Concerto in D major, an Andante in C for Flute and Orchestra and the Flute Quartets in D and G. The concerto genre has been a source of much investigation in the study of Mozart, and his genius for character portrayal in the concertos has been compared to his opera arias – reconciling virtuosity with the needs of dramatic expression. As the Mozart scholar Robert Levin has written: the vivacity with which the ensemble responds to and provokes the soloist, parallels the use of the orchestra in arias and accompanied recitatives as alter ego of the soloist. Mozart, the ever practical musician, tailored his writing to the abilities of the musicians that were to play it, thus tonight’s concerto not only displays Mozart’s compositional genius but also gives one a clue as to the abilities of Ferdinand Dejean as a flautist. Thus was Shostakovich’s private response to a question concerning the existence of a programme in his Tenth Symphony. Publicly, in a modest and often self-critical evaluation of the work, the composer closed with the general comment: `In this composition, I wanted to portray human emotions and passions’. On 5 March 1953 Joseph Vissaronovich Stalin died, choking to death over an agonising twelve hours. Thus passed one of the cruellest dictators of our time. In the immediate aftermath of the death of Soviet Union’s `Leader and Teacher’, the country experienced a wave of shock and uncertainty. Whilst the Politburo busied itself with a leadership struggle, Dmitri Shostakovich retired to his dacha in the composer’s retreat of Komarovo outside Leningrad. It was there, between July and October 1953, that the composer wrote his monumental Tenth Symphony. 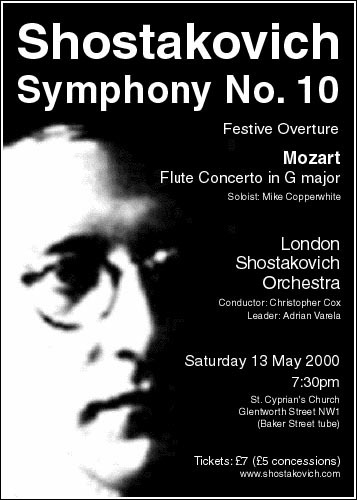 After the public disgrace of the 1948 Zhdanov decree Shostakovich, together with many of his fellow victims such as Khachaturyan, Kabalevsky and Muradeli, withdrew from the public genre of the symphony – Shostakovich dedicating most of his serious effort to writing chamber music. However, with the death of Stalin, Shostakovich appears to have felt the need to break the five-year long symphonic silence. As the scholar Ian MacDonald has written: the Tenth Symphony can hardly have been unrelated to the most important event in post-war Soviet history: the death of Stalin. As a realist, Shostakovich saw his art…as inextricably bound up with real life. And in his controversial memoirs, Testimony, Shostakovich wrote: …I did depict Stalin in music in…the Tenth [Symphony]. I wrote it right after Stalin’s death, and no one has yet guessed what the symphony is about. It’s about Stalin and the Stalin years. In the aftermath of the premiere of the Tenth Symphony – given on the 17 December 1953 by the Leningrad Philharmonic Orchestra, under Yevgeny Mravinsky – a huge debate ensued in the Composer’s Union. Shostakovich’s symphony was by no means received favourably by all members and it was the work’s prevailing mood, rather than its specific musical qualities, that came under attack. However, in the course of the discussion it became clear that Shostakovich’s symphony heralded (at least temporarily) a freer approach to musical creativity in the Soviet Union. The symphony itself is conceived on a grand scale. The opening movement is a brilliant example of making the most of a small amount of core material. Within the rather unusual structure of the movement, Shostakovich manipulates three themes with apparently effortless ingenuity. The Russian musicologist Boris Schwarz has described this movement as tragically `pensive’, the atmosphere clouded with dark memories. In this movement Shostakovich employs one of his favourite semantic devices – quotation. In this instance he quotes part of the second monologue from his song-cycle Four Pushkin Monologues, `What is in My Name?’. This takes on particular significance from the third movement onwards, as Shostakovich reveals his own musical signature, D-S-C-H. In this connection, Ian MacDonald has proposed that the squeezed one-note crescendi that abound in this movement, may in fact relate to some mannerism of Stalin’s personality or speech. If the first two movements address public tragedy, the third – a nocturne – turns inward, offering a window into Shostakovich’s private world. This movement is perhaps the most enigmatic of all, rich with personal significance that appears insoluble on all but the most general level. After the opening theme has been stated in the strings (a quote from the satirical scherzo of Shostakovich’s own First Violin Concerto), the woodwind present, for the first time, the composer’s musical signature, D-S-C-H (pitches D-natural, E-flat, C-natural and B-natural). This motive is to permeate the musical fabric of the symphony from this point onwards, adding further overtly personal significance to the music. Within this movement the D-S-C-H motive appears interleaved with a horn-call resembling the opening of Mahler’s Das Lied von der Erde. The horn-call is but another musical signature, this time of the Azerbaijani pianist and composer Elmira Nazirova. During 1947 Elmira took composition lessons from Shostakovich at the Moscow Conservatory. From this point Shostakovich seems to have developed an infatuation with Elmira as, between April 1953 and September 1957, he sent her no fewer than thirty-four letters – most of these dating from the summer and autumn of 1953, whilst the Tenth Symphony was being written. The horn-call appears a total of twelve times during the movement, suggesting the chiming of a clock at midnight. This nocturnal reference perhaps hints at the illicitness of Shostakovich’s feelings for Elmira, open to contemplation only after dark. The final movement, warily moving again into the public domain, opens with a sequence of doubtfully conferring woodwind solos, before launching into an allegro theme of simple rejoicing. However, it soon becomes apparent that there is lurking a brutal element in the form of a Georgian gopak (it should be remembered that Stalin was Georgian) presented by unison strings. Hereafter, the mood of the scherzo threatens to engulf the movement until the D-S-C-H motive confidently reasserts its authority (fortissimo, in full orchestral unison). A recapitulation of the opening idea of this movement resumes the tentative atmosphere, before a breathlessly absurd bassoon presents the main theme of the allegro. From this point onwards the feeling of optimism again begins to assert itself and drives the movement to an exultant close, with the D-S-C-H motive resounding triumphant. In the symphony’s third movement, as in the finale, Shostakovich `signed’ that indictment with the melody of his musical monogram.